If you have a craving to redecorate a room in your home, the bathroom is an ideal place to start because of its minimal square footage it can handle colors and textures that would overwhelm larger spaces. Check out these timeless steps and ideas to give this space the play it deserves with its own posh, polished look no matter the year. Signature Piece: Liven up your space with a bold piece to focus your décor around, like brightly painted walls or wallpaper and keep the rest of the room clean cut and sleek. High-gloss finishes — such as lacquer, metallic, or glass — reflect natural and artificial light. A classic white sink, toilet, and light fixture will balance the space. Tone It Down: Choose a soothing paint palette and accent with pops of bright colors in a rug, towels, and art. You can also add pops of living color with fresh flowers in a simple vase or for a longer lasting fix, try bringing the outdoors-in with succulents, air plants or a DIY vertical garden. It’s effortless, inexpensive, and easy to mix up the palette to give the room a unique and unexpected look without skimping on style. Focal Wall: A little bit of extravagance goes far in a powder room. Focus on the wall behind the vanity for a big impact. 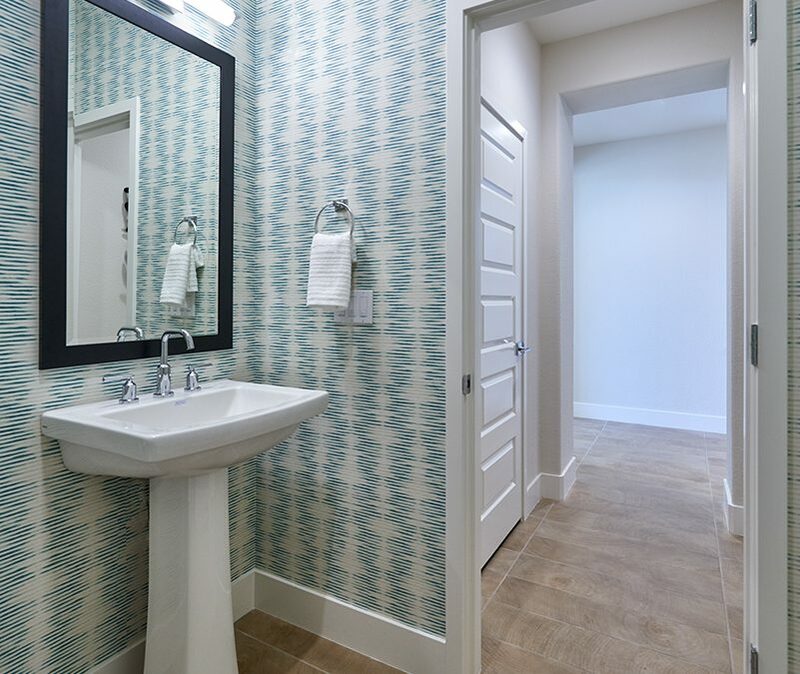 An accent wall wrapped in tile, wallpaper, or 3-D tiles will add color, texture and movement. This is an easy way to transform a space with one step. Own It: Make your bathroom your own with unique details. Add personality with freshly scented soaps and lotions, fun hand towels, bathmats, a new light fixture or quirky hand-towel holders. Small touches like these showcase your style and won’t go unnoticed by your guests. Now that you’ve let your design style soar and created a picture-perfect powder, move on to a larger space in your Signature Home! Need more inspiration? Signature Homes on Houzz! View our projects and ideabooks here or take a look at the Signature Homes Pinterest Boards. Be sure to follow Signature Homes on Facebook, Twitter, Pinterest and Instagram as we share news and updates about our exciting new home communities as well as helpful homeowner tips every Tuesday featured on our Facebook page relating to your new home, because we care long after your close of escrow.